This article is about the family car in 1980s. For the sports car, see Alfa Romeo 33 Stradale. For the racing car, see Alfa Romeo Tipo 33. The Alfa Romeo 33 (Type 905 and 907) is a small family car produced by the Italian automaker Alfa Romeo between 1983 and 1995. It was essentially an evolution of its predecessor, the Alfasud, which was based on the same floorplan, chassis and mechanicals albeit with some minor modifications. The Nissan-based Alfa Romeo Arna was launched shortly after, offering a similar size car but at a lower cost. The 33 has a unique place in the Alfa Romeo history, as nearly 1 million of these cars were produced internationally. During its 11 year lifespan the 33 saw a light facelift in 1986 and a significant restyle in 1989. 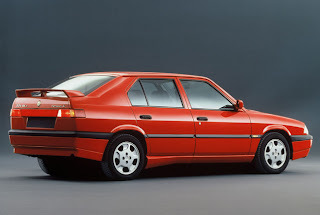 The 33 was discontinued in 1994 and replaced by the Alfa Romeo 145 and 146, which used the same boxer engines but built around an entirely new platform based on the Fiat Tipo. 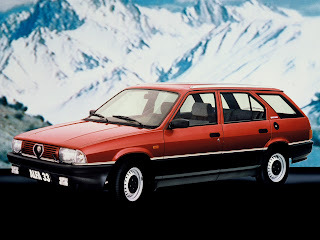 Initially known as the Alfa 33 (Type 905), the 5-door hatchback was launched in 1983 and a station wagon version (initially badged Giardinetta, later badged SportWagon) was introduced the following year at the same time as a four-wheel drive version of the hatchback. The hatchback was styled by Ermanno Cressoni at the Centro Stile Alfa Romeo, while the station wagon was designed by Pininfarina. Unlike the Alfasud, 3-door or coupe versions were not available. It carried over the 1186cc, 1350cc and 1490cc boxer Engines from the Alfasud along with its 5-speed gearbox. Top of the range was either the luxurious Gold Cloverleaf or sporting Green Cloverleaf models. The 33 became renowned for its nimble handling and powerful boxer engines, but also became equally well known for its unreliable electronics and tendencies to rust (a frequent complaint on Italian cars in general at the time). Another issue was its braking and increased unsprung weight — the Alfasud's inboard front disc brakes (mounted on the gearbox) had been moved to the more common outboard discs (mounted on the wheel hubs). The rear discs of the Sud's four-wheel disc arrangement had also been replaced with drums. The car featured numerous innovations for the company, including an instrument binnacle that moved up and down with the adjustable steering wheel, and a plastic bonnet. The UK launch promoted the sleek design, and the Daily Mail noted its low drag coefficient of 0.36, and very impressive in 1983 with only bigger cars such as the Ford Sierra and Audi 100 able to better it. A mild facelift in autumn 1986 resulted in a revised range when the 1.7 litre engine was introduced and a new interior which simplified the dashboard, and lost the innovative moveable instrument binnacle. Exterior alterations were limited to indicator lens colour changes and minor amendments to grill and bumpers. A 1.8 litre diesel engine was also introduced in some markets. The 33 was given a more extensive facelift in the end of 1989, the Series II or 'Nuova' 33 (Type 907), which went on sale in January 1990. This featured a revised interior, the introduction of fuel injection, the 1.7 litre engine upgraded to include a 137 PS (101 kW; 135 hp) 16 valve version, and a heavily restyled front and rear ends, in line with the new Alfa "family look" established by the flagship 164. Also new four wheel drive version was introduced called the Permanent 4, which was renamed to Q4 starting from 1992. Late production 33s also do not suffer from the rust problems of their ancestors, as their frames are galvanized in the manner Alfa Romeo introduced with the 164. Zagato made a tall-bodied three-door prototype, a Compact MPV anticipating the Renault Scénic by over a decade. Called the "Z33 Free Time" this was shown at the 1984 Geneva Motor Show, but the project remained a single prototype. The "Free Time" was no longer than the regular "33" at just under 4 metres (157 in) and retained most of its driving characteristics, but with greatly increased interior space. The tiny six-seater was based on the chassis of the 33 but was visually more related to the Giulietta. Last updated on 13 January 2014 at 18:09.